The lack of surprises from Europe's central banks yesterday left investors rather deflated as the expectations had already been built into the market. However, it was the downbeat comments from Mario Draghi that really dampened spirits. He went as far as saying that he expected the rate cut to have a limited impact on the Eurozone's economy. Needless to say, the bulls didn't exactly come charging out into the ring, and so world spread trading markets were left rather disappointed. And that was despite China also reducing rates in an attempt to help growth, which would usually lead to a decent increase in risk appetite. Question marks still remain over the BoE's quantitative easing program, which they have previously claimed has directly contributed to higher growth. Unfortunately, it has also caused inflation to spike to levels that are much higher than in the Eurozone and the US. This is one of the real factors that are hurting the pockets of consumers. The UK economy is stuck in something of a rut, and is most likely to remain in a recession in Q2. If the recent PMI data is anything to go by, we are going to need more than an extra £50 billion of QE to assist in the recovery. Sometimes recessions can be long and arduous, and in this case things are not being assisted by the dire straits of our biggest trading partner. In some ways I'm quite surprised that the BoE doesn't just keep hold of their cash or try something different. However, the problem is that they need to be seen to be doing something, even if it is still unclear what good QE does for the man on the street. For the FTSE 100, the 5700 to 5725 level remains the near-term resistance that it simply can't get above for now. With little support from US stocks yesterday, it's not surprising that we are seeing a little more profit taking, with the index down some 10 points to 5680 this morning. Financial Spreads account holders continue to hold a bearish view around these levels, expecting little in the way of upside for the index. These investors presumably feel that this isn't a bad position given that the resistance still hasn't been taken out. The big event in today's economic calendar is of course the US Non Farm Payrolls. Following yesterday's strong ADP figure, there's a glimmer of hope for some better news regarding the US labour market, and Mr Obama will certainly be hoping to see that. Consensus is for 90,000 new jobs, up from last month's 69,000, whilst the unemployment rate is due to remain at 8.2%. With the headlines focusing on the Libor issue, it's been nice to have something to discuss besides the single currency. Nevertheless, today's focus will be back on the Eurozone as the ECB makes its interest rate decision. The CFD trading market is fully expecting a cut of the base rate by 25 basis points to 0.75%. One of the main things that the ECB has managed to preserve is a slightly higher interest rate, giving it some room to ease monetary policy when the time came. However, the fact that they have waited this long, assuming they do cut the rate, seems like shutting the stable door after the horse has bolted. Such a move might help borrowers on the continent, but will do little to ease the pain within the banking sector. The decisions taken at last week's EU summit may have given indices a little boost, but the underlying problems are still persisting. There are also many political hurdles that need to be overcome, with some member states reluctant to give their full support to what was agreed. Opinion is becoming more and more polarised within the Eurozone. It seems that the Merkozy days are well and truly over, with relations between France and Germany becoming a little frostier. Unfortunately, we can expect to be talking more about the euro as time goes on as it remains the dominant force behind the macro picture. And let's not forget that the single currency itself is seeing some decent volatlity. As US investors return to their desk, their stock market indices seem to be in a relatively bullish mood. The Dow Jones index is not far off testing 13,000 and the technology stocks are also seeing some good strength. Interestingly, the US markets are still seeing gains despite the fact that even their own economy is looking like taking a turn for the worse. It seems that many investors are anticipating further stimulus from the Federal Reserve. What we've seen in the past few years is that central bankers simply can't resist pulling the trigger when things start looking bad. This may not happen for a few months, as any move by the Fed ahead of the November elections could be seen as being partisan. However, when the elections are finished, and with the US economy going the way it is, there's an increasing chance that we will see something from them. In contrast, the BoE is set to get the printing presses going again today, as the UK economy looks like it could remain in recession for a third quarter in a row. Whilst this recession is not as deep as the one we saw between 2008 and 2009, things are still tough for consumers and businesses. Having said that, there are some serious doubts about whether any more QE will actually help us avoid negative growth in Q2. 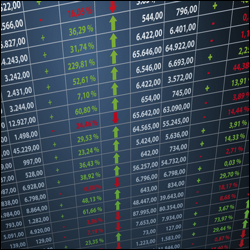 Yesterday's session saw the FTSE 100 drop by a mere 3 points to 5684 as the index struggled with thin volumes. This morning we're actually seeing a very small move to the upside, with the FTSE 100 currently trading at 5690. This rise will encourage the bulls who will be aiming for the near-term resistance levels at 5715 and 5760. All eyes will be on Mr Diamond today as he appears in front of the Treasury Select Committee to be grilled over the Libor issue. The fact that he has resigned is unlikely to make the MPs any less hostile, but equally it puts him in a much stronger position to defend himself. The mud-slinging might make for some interesting viewing as the BoE and senior politicians are dragged into the fray. I would also imagine that every other bank CEO will be watching to see what the implications may be for them. We can expect 'Libor-gate' to drag on and on as the Parliamentary committees bring in more and more people to answer their questions. A full inquiry is only going to further dominate the headlines. Whilst the drama unfolds, there will be several important questions to be answered. For example, how long was it known that this was a widespread practice and what was actually done about it? In addition, to what extent were officials aware at institutions such as the Bank of England? The internal memo released by Barclays yesterday is no doubt just the start of a raft of evidence for Diamond to defend himself with. Yesterday's better-than-expected US factory orders allowed spread trading investors to overturn the pessimism that had followed the previous day's weak manufacturing figures. This, along with growing speculation that the Fed will step in with new stimulus, saw bullish US investors push the Dow another 75 points higher to 12,943. Once again US stocks look much stronger than their European counterparts. Having broken to new recent highs, we could be gearing up for another little push higher. This won't happen today, however, as the US is closed for Independence Day. As a result, the focus will shift to Friday's Non Farm Payrolls. The Dow's rally did initially have a positive impact on the FTSE, as we had been calling the index to open higher. However, a pull back in copper and crude oil has meant that we're now in the red at around 5670. Despite the early weakness, the FTSE has broken above the near-term resistance and the bulls will be eying up the next levels at 5715 and 5760. Having said that, without any direction from US markets later today, we may have to wait for a sustained push. The longer Bob Diamond stayed on as CEO of Barclays, the more bad press the bank would have received as calls for his resignation would have grown and grown. Whilst most people don't actually know what LIBOR is, the headlines make for bad reading, especially with bank bashing remaining rife. Let's face it, no one would want to be the head of a bank that is embroiled in this issue when they have to face the Treasury Select Committee this week. The fact that he's taken this step doesn't come as a huge surprise after the resignation of the Chairman. When it boils down to it, the banks have been playing the market for their own benefit. That is true even if all they were doing was creating the liquidity and flow to provide a lower price at which to lend money to each other. Bob Diamond has only been CEO for a short time, but he was seen as a figure head for the overall banking sector and one of the best in his field. At least his appearance in front of the MPs should be a little easier. Barclays shares dipped by some 4% on the open, but they have already climbed back from the lows and pushed back into positive territory. Shares spread trading investors seem to have been quick to brush the issue aside, however we now have to consider the ramifications for the other banks under investigation. How far will the scandal go from here? Barclays is likely to be just the first of many banks to be fined and so there will be several nervous CEOs out there. The FTSE had been called to open some 15 points higher but the banking sector initially dragged us lower following the news of Diamond's resignation. Nevertheless, those early losses have now been reversed and the index is currently up by 10 points. Yesterday, the market closed right on its near-term resistance levels and is testing them again this morning. The bulls will be hoping that a move above 5650 will open the way for 5715 and then 5760. On the downside, support is at 5615, 5585 and then 5540. Whilst the economic data has not exactly excelled recently, there has been the odd glimmer of hope. Yesterday's UK manufacturing PMI, whilst it was still pointing to contraction, did come in higher-than-expected. We also saw a couple of slightly higher-than-expected Chinese PMI numbers which have given metal prices a little boost. For the UK, the PMI surveys have been consistently pointing to an economy that is in much better shape than the official GDP figures suggest. Therefore, it seems that businesses are busy making their orders and feeling a little more confident, but this is yet to filter down into the wider economy. Today will the UK's construction PMI number. The construction sector has been a real drag on GDP lately, but today's figure is expected to improve. Financial spread trading markets are in much better shape following the EU summit at the end of last week. However, there is still some scepticism regarding the viability of what was agreed and whether it will be enough to pull the Eurozone back from the brink. For starters, even though the Dow Jones put on an impressive near-300 point gain on Friday, US investors' confidence dropped to the lowest level for 2012. This came despite ongoing improvements in the housing sector. The last session of June saw the index posting its best monthly gain for the year. This would suggest that American investors are more confident that the latest European sticking plaster is going to work. Not only is confidence still taking a dent, but Spanish borrowing costs remain well above the 6% level and so things have barely improved things for the country. Finally, the risk-on trade over the last couple of sessions has been rather muted to say the least. Many of the riskier shares, such as the miners, have simply not joined in the party and continue to remain a drag on the stock markets. This is particularly true for the FTSE 100 because of its heavy weighting in the sector. So as the doubts remain, it will be interesting to see how things pan out through the summer months. With July underway, we can look back at how the month has historically panned out for the FTSE 100 since the mid 1980s. This shows that there have been as many up months as down months, and so there isn't any clear bias for the bulls or the bears. Having said that, the months that have seen gains have been much stronger on average than the months where losses have occurred. July has also been quite volatile in the past but volumes could suffer as the Olympics draw near. The FTSE 100 is adding to Friday's gains this morning but with no real great conviction. At the time of writing, we are higher by 15 points to 5586 and just below the resistance seen at 5600 and 5640. This has attracted some sellers who think that the resistance will win, but a break above here might see a test of 5715 and 5760. To the downside 5530, 5470 and 5430 are all seen as support levels. Today's economic data comes in the form of lots of manufacturing numbers. PMI surveys from the US, UK and Europe will all be watched to see how the sector is getting on as it continues to significantly underperform. Today will also see the EU unemployment figure, which is expected to tick higher, and then we will gear up for the BoE and ECB rate decisions on Thursday and the Non Farm Payrolls on Friday. The euphoria over the euro banking agreement has sent stock markets higher but the shine seems to be fading as I write. In reality, the banking side was always the easier part of the problem. The banks are actual legal entities that have to operate in a fiscally responsible manner, don't laugh, whereas national governments clearly do not. The real question is still out there, namely the pooling of Eurobond risk which the Germans are naturally averse to. Oddly enough the powers that be might not be too unhappy about a general default of sovereign debt in the South, so long as the banking system remains intact. The spread trading markets are not sure about the politicians' intentions and this can be seen in the yields of Spanish debt. Yesterday they spiked up to 7% again but this morning they have pulled back to around 6.55%, which is the level we were at a couple of days ago. This is actually slightly worrying because few believed that there would be any kind of agreement from the summit. Therefore, the unexpected backing of the banks could, and perhaps should, have had a more positive effect on yields. On current deficit levels, Spain can no more afford 6.55% in the long run than they could 8, 10 or 15%. With virtually every EU nation either actually in recession or just about bobbing above the line, we need yields down around 3-4% to afford room for stimulus packages. Without this, the cost of sustaining the debt burden will wipe out any positive impact that new spending would achieve. The FTSE fell to the support levels at 5435/40 before finding some reasonable buyer interest. After this, the index markets were then subject to several surges between the late afternoon and 04:00 this morning (London time). The first surge came at the European close as traders covered short positions before any potential summit announcements. The second jump came at the close of the US markets as, presumably, the Americans did the same thing. Since 16:00 yesterday, the FTSE has traded in a near 200 point range. We are now sitting at 5555, having hit 5620 overnight, and the heavy resistance level at 5545/50 must now be seen as critical support. The FTSE has had quite a few attempts in recent sessions to hold above the 5520-50 range but it has failed every time. If we slip back under 5540 and then the 5520 level, there could be a renewal of bear positioning. The DAX has rallied the most of the major indices and is still well up on yesterday's evening session. Traders will be looking at 6280/85 as an initial support area, with the previous resistance at 6245/50 now also acting as support. On the upside, the bulls will be looking to press above the overnight highs of 6335/40 and, if confidence can be regained, a move back into the mid 6500's. Today sees the start of the latest European Summit. We will all wait with bated breath for the rhetoric from Paris as each nation tries to come up with some way of selling the plans to their electorates. Merkel's apparent comment to her MPs that any move to force Germany into guaranteeing other countries debt will be 'over her dead body', rather puts a dampener on the chances of success. The West Germans are still paying huge sums for the assimilation of the East, with no real sign of this changing in the medium-term, more than twenty years after the reunification. And that is with fiscal control. It is understandable, therefore, that they would baulk at the idea of having to do the same for Southern Europe. Especially without any kind of checks and balances on the fiscally imprudent governments. The FTSE spread trading market has tried to get a foothold above 5500, with our quote almost hitting 5550 overnight, but this morning discretion seems to be the better part of valour. The ever increasing number of profit warnings from mid-tier companies makes it difficult to see there being a sudden economic boom in the near-to-medium term. In this light, a major rally is probably not the most likely outcome, however, it must be mentioned that current equity yields are exceptional when compared with virtually any other asset class. Therefore, long-term players, who can afford to ride the dips, will be slowly putting in small percentages rather than sitting on their cash. Some of the better rated companies have been returning to the bond markets as, due to the incredibly low Gilt/Bund/Treasury yields, corporate debt issuance is now far cheaper than equity. The general lack of IPO's over the last few years, coupled with more and more quoted companies going private or being merged/acquired, has also restricted the attraction of shares. As the need for increasingly short-term 'results' from quoted companies has restricted performance, more and more investment money is drifting away from the markets and into private equity funds. As a result, volumes on many of the leading stock exchanges are looking dire. The FTSE is currently trading at 5490, with light support at 5475/85 and then below here at 5435/40. For the bulls, the weak bounce is a bit unnerving but the near-term hope is for a return above 5520 and a renewed attack on 5545/50. The DAX, which two months ago was almost 1200 points above the FTSE, is now just 700 points higher, having fallen over 1000 points during that time. For all of the power of the German industrial machine, the fiscal future does not look bright. Either the country is going to be saddled with a large amount of other nations' debt or they will have to kick out the failing countries from the euro. This would see their weak currency benefit evaporate and could bring massive social disorder to their doorstep. The bears will be looking for a retest of the major support level at 6100/10 but will first have to overcome volume support all the way down. On the upside, the message is much the same as for the FTSE, with the initial target being 6220 and then 6240/50. Also see today's report 'Libor Scandal: Barclays Just One of Sixteen Banks'. As we approach tomorrow's start of the EU summit, expectations are building that we will see something new to help calm the markets. In the run up to the meeting, the FTSE 100 and other European indices have seen a lacklustre performance to say the least. Germany is refusing to offer its financial might as guarantor to save the euro once and for all. For the German Chancellor to say 'not in my lifetime' sets a clear precedent and makes it impossible to see the markets getting what they want. So why aren't the spread trading markets selling off more and pricing in this inevitability? Sometimes investors wait for the horse to bolt and it really is anyone's guess as to what will be agreed. On the one hand, bulls are unwilling to give up their long positions and don't want to miss out on any potential upside if expectations are exceeded. On the other hand, the bears don't want to bet on something that seems too good to be true. As a result, this morning we are sitting in a narrow range, just as we did yesterday, with a slight bias to the upside. It looks like some opportunistic bulls are pushing the FTSE 100 and other European indices higher at the open. They seem to think that, no matter what the outcome of the EU summit, there will at least be some sort of action taken. It might come in the form of a new agreement on debt issuance and/or perhaps some new treasuries. This way Merkel can tell her voters that it's not a Eurobond backed by them, whilst investors will have something to think about that might just improve sentiment. One major change that the financial spread trading markets really want to see is an update of the ECB's remit. However, any amendments would require substantial treaty changes and these are not going to happen in the next couple of days. Therefore, even though the markets might be a little more optimistic this morning, we're most likely to see a few more sticking plasters put over the wounds. As mentioned, the FTSE 100 is a little brighter on the open, adding some 20 points to 5466. Very near-term resistance is seen around 5515 but then we have a more significant barrier at 5600. Our spread trading account holders are a little split over what they believe will happen to the European markets, with clients largely sellers of the FTSE 100 and buyers of the DAX 30. Economic data is thin on the ground today, with this afternoon's US durable goods and pending home sales the only figures to focus on. European spread trading markets dropped yesterday as pitiful volumes combined with a large wave of uncertainty. This week will climax with a two day EU summit and investors are increasingly doubtful that any sort of meaningful resolution will be agreed. There'll be lots of talk about a closer banking union and fiscal integration but nothing that the markets are crying out for. They want to see a German backed firewall and a new remit for the ECB to get the printing presses running. There are several lessons to be learnt from the whole euro project. One example is that a currency union simply isn't possible unless you have explicit rules in place to prevent poorer nations borrowing way beyond their means and ramping up their public sectors. The Eurozone crisis is here to stay I'm afraid, probably for years to come. Cyprus has now become the fifth nation to seek a bailout and most investors seem to expect Greece to exit within 2 years. The next test for Greece will be at the bond redemption in early August where they will probably need to tap into the bailout funds to survive. All this and the new Greek Prime Minister will not be able to make this week's EU summit. At least a new finance minister is due to be announced today after the newly elected Vassilis Rapanos had to resign due to ill-health. As long as Germany continues to refuse the launch of a Eurobond, the crisis has no way of being resolved. It is so unlikely that they will ever guarantee the debt of poorer nations that the demise of the euro remains a highly likely outcome. It's not often that I actually praise politicians, but in hindsight one of the best decisions Gordon Brown ever made was to keep us out of the single currency. The index spread trading markets are taking a breather this morning, with the FTSE just in the black by some 10 points at 5460. Since rejecting 5600 at the end of last week, the recent run lower has meant that June's gains aren't quite as impressive anymore. The FTSE has now risen by only 2.5% over the month, compared with a 5% gain just a week ago. The 5300/5250 area is the major near-term support, whilst 5600 is still acting as resistance. As yesterday's poor volumes indicated, we are starting to move into the summer months and so there could be some interesting volatility in the weeks ahead. Our reliance on the internet is being highlighted in one of the most frustrating ways. Tens of thousands of RBS and Natwest customers have suffered from several days of faulty banking services. As a financial services company ourselves, we make almost 100% of our trades online or on mobile devices. A technical glitch of such magnitude would cause no end of problems and worries for our clients. However, it's not necessarily the dependence on the internet that is so worrying; it's how the debacle will affect the banking sector itself. As if banks hadn't had enough bad PR over the past few years, the last few days have put Natwest customers' resolve severely to the test. The payments system has become a part of every day life as salaries, bills and mortgages all need to be paid on time to keep the economy turning. As a result, the backlog of hundreds of thousands of transactions that these errors must have caused doesn't warrant thinking about. The weekend openings didn't help matters either. Some branches opened on Sunday for the first time in their history, but staff were unable to help because the computer system had frozen up. Unfortunately for RBS the damage is irreparable. They will lose customers as a result and the problems will only feed the general anti-banking rhetoric. For the financial spread trading markets, we start the week just as we left off, in selling mode, as the crisis in Europe continues to dominate the headlines. With the newly elected Greek Prime Minister and finance minister being incapacitated, important meetings with EU and IMF leaders have been cancelled. The meetings had been scheduled to discuss the results of the Greek election and how the country will continue to deal with its bailout package. This week's upcoming EU summit will also have fewer Greek delegates than it should, and this isn't helping to settle any nerves. In the indices spread trading markets, the FTSE 100 is currently around 25 points lower, trading at 5485. The DAX 30 is in even worse shape as the German index has already fallen by over 1%. The shares markets are telling EU politicians that time is fast running out if there is to be a proper solution to the crisis. Economic data is thin on the ground today and there won't be a huge amount for us to focus on throughout this week. We will at least see some new home sales data from the US this afternoon, and this could move the markets if it's way off expectations.